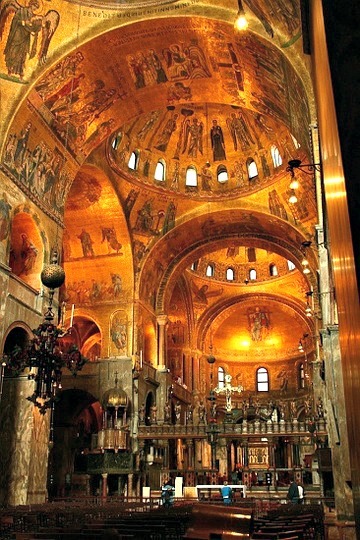 Why Basilica of San Marco has the cities treasure....? 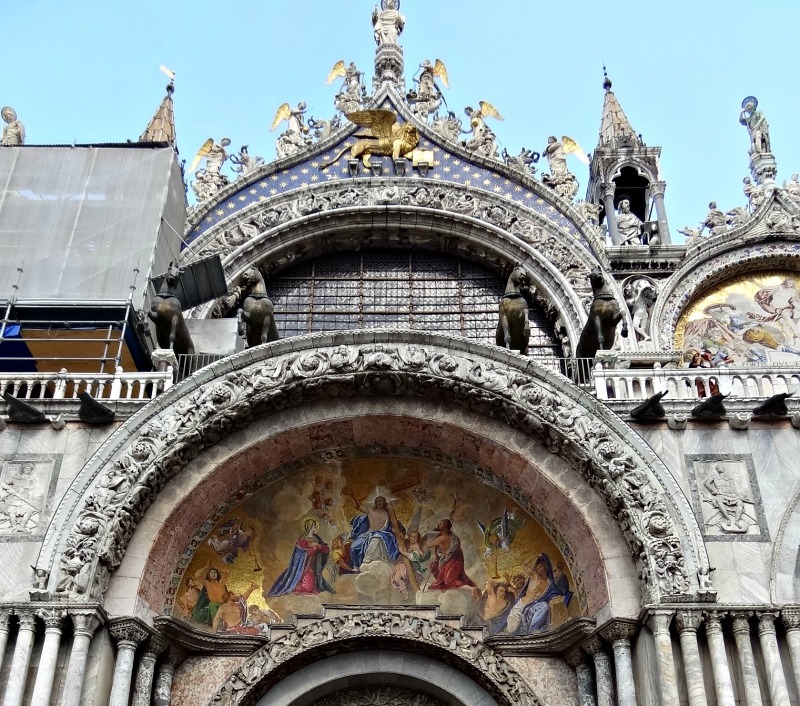 "It is all GOLD when visiting Basilica of San Marco"
One pair of eyes is not enough to see the wonder and treasures of the Basilica of San Marco. Nearly 1000 years of architecture, lots of mosaic and gold. I like it very much when the first-morning glow puts the basil in a spotlight. Everything seems to shine! It’s beautiful. One of my ideas is to combine your visit with the Basilica and the Doge Palace, including a guide with a 2 hours tour! Because I hold a partnership with Tiqets.com (also a helpdesk for questions), they have a single combination ticket for this tour, and you do not have to be in the long entrance waiting queue. Pay with your credit card. You will immediately receive the tickets to use them on your mobile phone. The Basilica of San Marco is thanking her name to Saint Evangelist Marcus. His remnants and relics were brought to here by the Venetian. Before this, it was a chapel for the doge from the Doge Palace. Basilica di S. Marco is open from Monday to Sunday from 9:45 am to 4:45 pm (Sundays from 14:00 to 16:00). The interior of the basilica is free to visit and will take about 15 minutes. A rope delimits the section. Be careful not to wear clothing with too much exposure. You can visit the golden altar (Pala d'Oro) for EUR 2, - p.p.. Lots of gold and bling bling! Entrance costs EUR 5,- p.p. This museum is worth visiting. The treasure room (Tesoro) costs around EUR 3, - p.p. With lots of stuff and well-known remains from the Venice trade history. Visit the website www.basilicasanmarco.it for more information. Please look closely to the front MOSAIC ! Of course, you'll have to wait for less if you're neat at 9:45 pm when the basil is open. Even at the end of the day, there will be no waiting line. It will come with the hustle and bustle. TIP! Just stop at the front of the St. Mark's Square. Look at the façade, and you will see the different mosaics that each portrays has. Each has their own story. TIP! Maybe good to do. The basilica is open for prayer between 7:00 and 9:45 in the morning. The entrance is at the Piazzetta dei Leoncini. If you are in front of the basilica, the door is on the left. Wear clothes which fit a church and don’t bring to conspicuously your camera ;). In the year 828, Venetian traders took the relics of the evangelist Marcus from Egypt (Alexandria). They smuggled them into a barrel of pork fat to mislead the then ruling Muslims. The treasure caused the basilica to become a pilgrimage. And this led to more trade. With this extra income, the basilica became more prominent and more beautiful to keep all the treasures. The present basilica dates back to the year 1071. The marble floor, the precious ornaments, and the golden mosaic are giving the basilica an oriental mysticism. In the Tesoro (church treasury) the Byzantine loot is preserved from the year 1204. Rare beauty. Because the basilica is next to the Palazzo Ducale, faith and politics have been used together many times. Venetians who came to the basilica knew very well that not the Pope but the Doge was the boss. And that was often made known to them. Basilica di S. Marco is a war-filled museum, with beautifully decorated pillars. It is the treasury of the former republic of Venice. 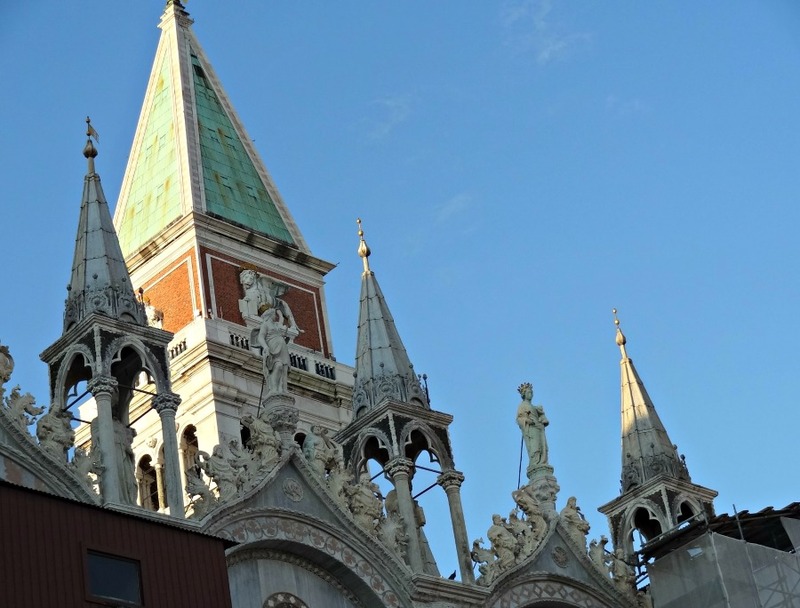 For the Venetian, it will always remain their Basilica of Venice. 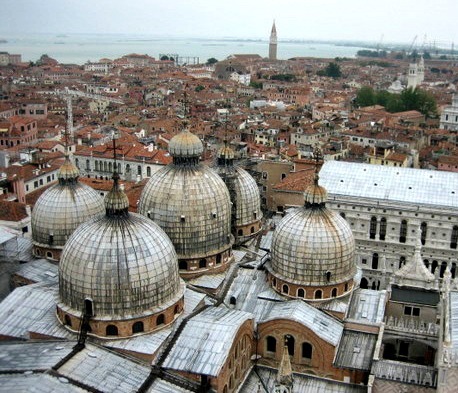 In all these years Venice collected all beautiful gold and luxury from all over Europe. It is to show what kind of wealth they had. On the west side of the Basilica, you will see the bronze (copies) horses from Constantinople (from the year 1204). The beautiful thing is that you can admire them close on the balcony/gallery where they are located, and you have a view over Piazza San Marco. Inside are the real golden horses. 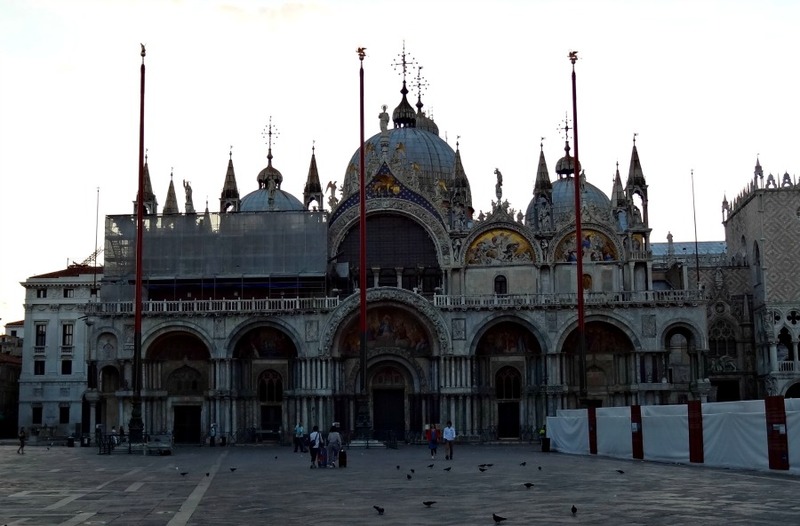 You have read about Basilica di S. Marco in Venice. There is enough to discover as you read. Discover my site about Venice and get more information about this beautiful Italian city.